Since 2001, I have read tons of books about programming. 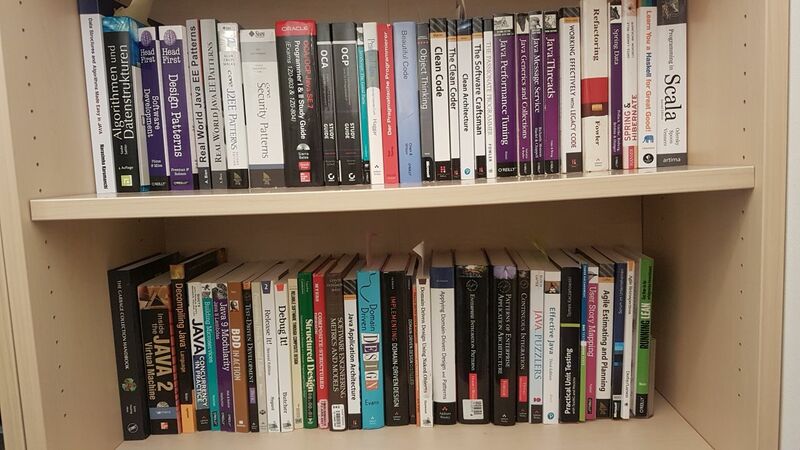 This page is dedicated to a best of the best list of Java books and general programming books I have read so far. On your journey to becoming a Software Craftsman, I highly recommend that you read every single book I have mentioned on this page. Head First Java is a perfect fit for beginner to intermediate Java programmers. yet still covers a LOT of ground in a very short time. Yet another great Java book of the famous O’Reilly Head First series. Fun to read and very motivating. Much easier to digest then the original Gang of Four book! This Java book is aimed at more experienced Java developers. You need to have a few years of experience in Java before reading this book. It will teach you Java from scratch – just in WAY more detail. It is aimed at developers who want to do the OCA / OCP certificate, but I would recommend this book to anyone who wants to get a deep understanding of the Java programming language. I personally use this book as a reference, or as inspiration for many of my video tutorials. This Java book is another all-time favorite of mine in my Java library of a few hundred books. In the 3rd edition of this famous book, Josh Bloch gives you 90 actionable items that will improve your clean coding style. I personally use it as a reference as well as an inspiration for my Java Clean Coding videos! I am a big fan of Robert C. Martin. He originally coined the term “Clean Code”. What else can I say? Read this book! I devoured the book in a matter of days! Yet another awesome book from Robert C. Martin, or Uncle Bob! You seriously need to read this book! As with “Clean Code”, I devoured the book in a matter of days. The Pragmatic Programmer. From Journeyman to Master – Andrew Hunt and David ThomasAs this book was first published in 1999, it is probably the grandfather of all Agile / Clean Coding books. If you seriously want to become a Software Craftsman, then you must read this book. A very slim (72 pages) book, that will guide you along your way from journeyman to a Master Software Craftsman. After reading this book I joined a local Java user group as well as a Software Craftsman guild, and soon after that I started this blog. If you execute what Chad teaches you, this book can change your life! I love short, pragmatic, actionable books, without too much pathos. This book will teach you how to do (Unit)-Testing properly. This book is tough. Not an easy read, and it took me a while to digest. Domain-Driven-Design into my video tutorials. In this book Vaughn Vernon aims at explaining Domain-Driven Design in an easier way. Well, digesting it was easier for me, but that might also be because I read it many years after reading the book from Eric Evans. If you want to seriously get in touch with Domain-Driven Design, then you should definitely also read this book. A famous book that covers a completely different, but very important aspect of software development – releasing it. Full of great ideas and stories, and an easy read.